The latest brand new arcade games from legendary manufacturer Sega. Lowest prices guaranteed, free delivery, backed by award winning service. In this awesome guide to arcade machines, we take you through the maze of choices. Sega came into being in 1965 as the result of a merger between Rosen Enterprises and a Honolulu-based company named Service Games (which is where the name "Sega" comes from: Service Games), which had been around since 1940. Since then, they have created some of the best-loved arcade games of all time, including Out Run, Space Harrier, Hang-On and After Burner. We are proud to be suppliers of some of the greatest new Sega arcade machines, which represent the culmination of five decades of experience in gaming and arcade magic. These brand new arcade games from Sega are proof that Sega are still making some of the most incredible arcade machines today, using the most up-to-date technology available and giving you gaming experiences that simply can't be replicated on a home console. Storm Racer and Storm Rider are simply phenomenal racing games that take everything Sega has learned about driving games in the decades in which it has been making them, and tweak it into a brand new formula for the modern arcade market. Sega still makes some old favourites too, though with modern technological updates and hardware. The Virtua Tennis series has long been a favourite with sports fans, and Virtua Tennis 4 DLX is the pinnacle of the series to date. This fantastic machine will be sure to catch anyone's eye in a home or public arcade setting, and with the four individual control panels, there's always the temptation to grab a few friends and start a match. Sega are quite simply masters of the art of making arcade machines, with one of the longest pedigrees in the industry today. There simply is no substitute for a brand new arcade machine, whether you're running a public arcade or just want the very best for your home. When you buy a new Sega arcade machine from Home Leisure Direct, you know that you're getting an unparalleled arcade experience from the best manufacturer and the best retailer. 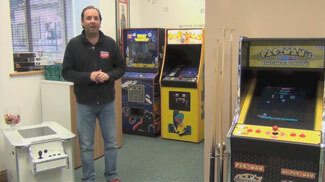 We stock a wide range of your favourite arcade games various different styled arcade cabinets. Click on the links below for more information. We provide a 30-day parts warranty with these machines. This doesn't cover accidental damage or mis-use.